How early do you get started making Christmas gifts? Are you one of those super plan-ahead people like my friend, who started back in February? Or do you wait until November? August or September tend to be my ideal time—when school is starting and fall is arriving and winter’s approach is inevitable, that’s when it starts to feel like a good time to prepare for Christmas. 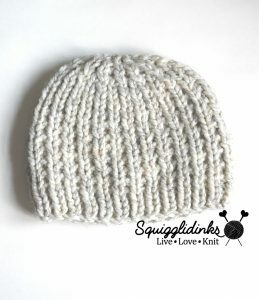 I have a bunch of people to make gifts for this year, so I’m knitting a bunch of hats, and I’ll share them with you as I go. 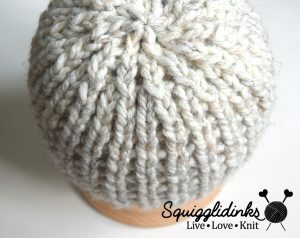 They’re great hats to make no matter when you’re starting to make gifts, because they’re really quick knits. 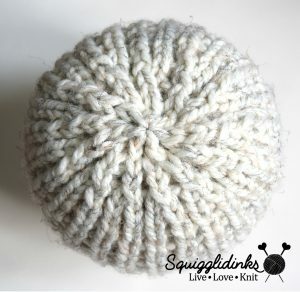 I’m using super bulky yarn on size 13 needles so that they’re snuggly warm plus they’re fast and easy to make—wins all around! 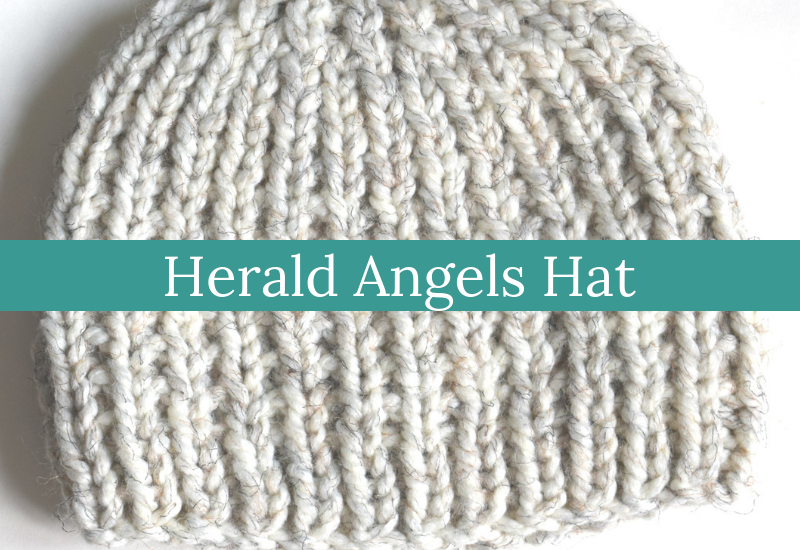 Click here if you prefer a large print, ad-free, inexpensive printable PDF of the pattern from Ravelry. Yarns used: Lion Brand Wool-Ease Thick & Quick (super bulky (6); 86% acrylic, 10% wool, 4% other fiber; 106 yards/170 grams), 1 skein of Wheat. Rounds 1-4: k1, p1, repeat to end. Round 6: k1, p1, repeat to end. Repeat rounds 5 and 6 until hat measures 5.5 (6.25, 7.25) inches or 14 (16, 18.5) cm from cast on edge. Round 7: ssk, k2, repeat to end. Round 8: k2, p1, repeat to end. Round 9: ssk, k1, repeat to end. Round 10: k1, p1, repeat to end. Round 11: ssk, repeat to end. For Child/Teen and Lg. Adult sizes, Round 12: ssk, repeat to end. For Adult size, Round 12: ssk, repeat to last st, k1. End on a row 1. Bind off.